Summary: The PetZoom Nail Groom is a uniquely designed pet nail filer that comfortably trims and smoothes your pet’s nails quickly, easily and without any pain. Your dog and cat will never hide from a nail trimming again! The PetZoom Nail Groom is a uniquely designed pet nail filer that comfortably trims and smoothes your pet’s nails quickly, easily and without any pain. 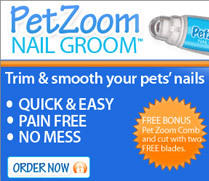 PetZoom Nail Groom doesn’t pinch or injure your pet’s nails. The stainless steel filing disk is curved so the nail rests on the plate comfortably. The tip and sides of the nail are trimmed at the same time, for perfectly trimmed nails in less time. The compact PetZoom Nail Groom design fits comfortably in your hand. This pet nail trimmer and shaper also features a large protective nail guide for safe trimming and protective cover that catches filings so you can trim your pet’s nails anywhere without the mess.